Wow..! Today was so great, I’m not even sure where to start. One reason for today’s awesomeness is: Today is Noah’s six month birthday…! I can’t believe it’s already been six months since God blessed us with this cute little guy – time really does fly. As I’ve said before, this has been the best six months of my life, and what’s even more exciting is that each day is better then the day before! Talk about being able to breathe. I’ve been dreading the “six month CBC test” every since I’ve known about it. 🙂 I’m glad it’s over with, and we can move on (at least until it has to be ran again at his one year birthday, but we’ll cross that bridge when we get there!) Everything else at the check up went very well. Noah’s excelling in almost every area; he’s just having a tough time gaining weight, but that’s not a big deal. In fact, I think some of it has to do with his frequent visits to the physical and occupational therapist. This little dude burns some calories! We’re going to be giving him supplemental formula in addition to breast milk to help him gain some weight. We take him back to his pediatrician in two weeks for a weight check, and hopefully the little guy will have gained some weight! We had time to squeeze in lunch at one of our favorite Tex-Mex places, Mi Cocina, before taking Noah to his physical therapy appointment. 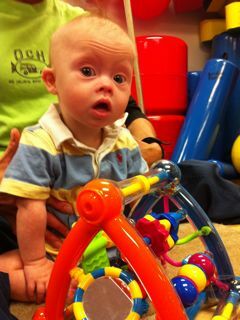 His physical therapist tried out some new exercises with Noah using a platform swing which he seemed to really enjoy! It was so fun watching his expressions as he swung back and forth! We really enjoy all of the therapists we’ve worked with at Our Children’s House at Baylor, and couldn’t be happier with Noah’s progress since going there. They all agree that Noah is doing incredible, which is very encouraging for Abbie and I to hear. Finally we ended the day with a huge milestone – Noah being able to eat his first (non-liquid) meal! Now, most moms go to the store and buy stage 1 baby food, not my super wife! In light of this once-in-a-lifetime occasion, she made Noah an amazing bowel of home made baby food, and as you can see, he really liked it! He scarfed down the entire bowl! It was really neat seeing him be able to eat so well, especially after all of his eating problems during the first few weeks of his life. God has really brought him a long way…! We are so thankful. On happy (and full) baby! It’s been an incredible six months, and we are paying for many, many more six months birthdays! We have two big things on our calendar in the coming months for Noah that I’d love for you to be praying for. In August we see Noah’s cardiologist to see how his atrial septal defect (ASD) is doing. (Side note: an ASD is a small hole in the heart that is common in children born with Down Syndrome.) We are praying that it will be completely closed when we visit the cardiologist, and no heart surgery required. We also will be seeing an urologist in the next few months about another small issue. I’d appreciate your prayers that all goes well on that visit as well. My wife and I are both overwhelmed with the response we have had to this website. We have received many messages in the short time this site has been up, and have been encouraged by them all. One that was especially meaningfully was from a mom with a pre-born baby that had been diagnosed with Down Syndrome. She wrote in to tell me that she was very encouraged by the daily Noah’s Minute videos, and that her and her other small child watched them together every day. Wow….that alone makes it worth the time it takes to put up a video every day. 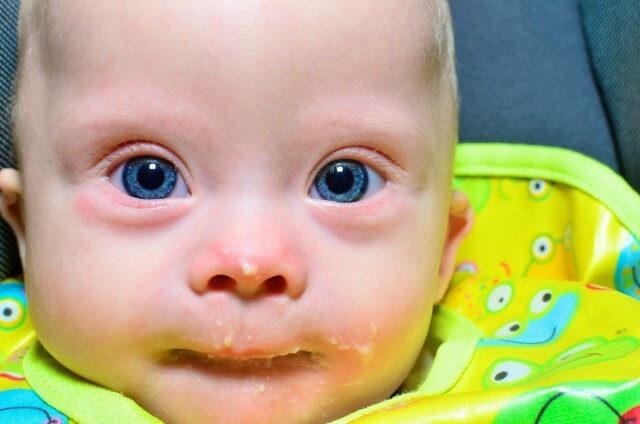 In fact, one of the reasons I started this site was to encourage new parents by giving them an inside look at family raising a child born with Down Syndrome. Thank you for being a part of our journey, it means more than you know! Finally, I’ve made it very simple to stay connected with our journey. Please take a second to visit our contact page and subscribe today! Be sure to connect with Noah’s Dad on Facebook, and twitter as well. We look forward to meeting you and hearing your story. Ha,ha..you’re right! He didn’t want to stop! I’m going to post the longer video soon on another post! It’s especially cute! I’m so glad everything went well today!! I prayed everything would be good with the cbc!! It was so much fun to see all of you yesterday!! Hey…..so good to hear from you! Thank you so much for your prayers, God is so faithful! Seth’s eating in this video. I think he was in his first week of baby food. That’s awesome…! He looks so stable in the bumbo chair! Abbie said we are going to have to try that next time! Harrison will be 7 months tomorrow. He only has PT 1x every other week from EI…but I work (if you want to call it that ;0) with him everyday as well. He rolls in both direction and sits with support. We’re going for his 6 mos. bloodwork on Monday; we tried to go a few weeks ago but they couldn’t get anything out of his tiny veins, so I’m taking him to the outpt. lab at W & I Hospital(Prov, RI). His clinical exam’s dx. of DS was a complete surprise to us about 24 hrs after he was born. He was dx. in the NICU, where he was sent at 12 hrs. old due to o2 de-sats. He has NO medical issues associated with DS, just muscle weakness, and he is small (only 11 lbs now) and growing/gaining very slowly. I breastfeed, supplement occasionally w/ formula, and he’s eats babyfood 2x daily. He is the happiest, sweetest, snuggliest baby I’ve ever had the pleasure of being around. His smile is contagious, his laugh intoxicating, and his eyes seem to know the greatest kept secrets of the universe. He loves his family; especially his big brother who he literally lunges and reaches for, and will roll and push or kick himself toward! Harrison is my 2nd born. I found out I was carrying him on my husband’s birthday. My husband had a hunch I was pregnant and said the night before “that would be the most amazing birthday gift ever”! So, fatefully that morning our then 1 yr old, Jamison, woke up around 4:30am and before getting him out of his crib I decided to take a test! I then got to tell my son a wonderful secret as I nursed him in his room… he was going to be a big brother! Jamison and I gave Dadda a birthday card from BOTH our kids that morning!! I knew immediately I was having a boy and was so thrilled that Jamison would have a brother and best friend to grow up with. My pregnancy was pretty wonderful and very much like my 1st. I opted for not getting prenatal tests again; I’m young, had no risk factors, and knew this baby was going home with us no matter what. I went in to preterm contractions at 31 weeks, just like with Jamison. It was about at that time though that Harrison went from head down to transverse and breech posiions ( he kept changing). My ob and we decided on a planned c-section for June 20th due to his being breeched…but Harrison decided “he was out” on June 13th via emercency c-section instead. Of course, my husband was about an hour away at work…and Jamison and I had just shared a 3-egg omelet for breakfast when I finally gave into the reality that my contractions were the real thing this time (4 minutes apart) and I needed to call my ob. If the doc and rn’s suspected his dx in the delivery room or in post-op recovery…I was oblivious to it at the time. Now after reading Noah’s birth story I wonder if they had an inkling though. I’d never experienced a c-section, and my ob wasn’t there,so obviously I don’t know what’s normal and what’s not. I thank God he wasn’t dx. during pregnancy… I truly got to enjoy those special months without having the excess worries about his health and possible challenges and outcomes. And I thank God for that first day and evening, when we all got to meet him, hold him, fall in love with him. He was simply our baby Harrison for those hours; it was our “before DS” time and I am desperately trying to cling to those first memories… to some extent the last of our “normal” life. At 10:30 that night my world changed forever. An RN comes to my room shortly after Harrison returned to the nursery so I could get some sleep…somthing about they did’t like his coloring and I should’ve called them if I saw it. Told them he seemedfine to me – I had nursed him and then he had fallen asleep in my arms. A little while later I get a call…something agaain about his coloring, gave him some o2, needs more monitoring… going to NICU for observation. They wheeled him into my room so I could see and kiss him goodnight. I planted kisses on his cheek and forehead, told him I loved him and would see him soon, and then he was gone. I spent the night crying and praying and trying to find out what was wrong with my son. No one could tell me anything. I called the rn station, called the NICU. I was told I’d have to wait until after rounds in the morning to talk with a doc and for more info. Our pediatrician came early the next morning and was shocked to find out he was in NICU… she hadn’t been notified. After she left I asked the rn to be wheeled to see him (he was in a different building than me). He had wires and Iv’s and a nasal cannula… i still got no answers; just that he had an ECG xrays and some other tests and everything came back normal. normal. The moments after “the talk” with the docs…the 24 hours waiting for the FISH to come back, having the “talk” with our family, and the 6 days he spent in the NICU were the worst of my entire life. It was the birth of our child…and yet we began grieving for our son and the future and our normal life. Fast forward almost 7 months. We have a new normal…something that would have naturally occurred even if Harrison didn’t have DS; because we went from family of 3 to a family of 4!! I still have some bad days… the days when fear gets the best of me; but I have a ton more wonderful days; days I get to spend with my 2 amazong sons and incredible husband. and, of course, our story is still evolving, too. And I have so much more that I could say and share about my Harrison (and my Jamison, too!). Every day they both do something new…they each give me reasons to smile; and new reasons to worry, too! Most of all, they give me more love, joy, and pride than I could have ever imaqgined possible. I’ve learned so much in these past 6 months: about DS,of course; about overcoming challenges, odds, obstacles, and misconceptions; about faith, prayer, and love; about support, family, anf friendship….i’ve learned we don’t usually get answers to our “whys”…and don’t find peace even when we do. I’ve learned that we don’t know what the future holds for any of us…but we do have the power to influence our future to be brighter; simply by living life in a meaningful and joy-filled way, looking and hoping for the positive, and being realistic, accepting, and proactive about both the negative and the positive. huh…just now, as I was typing, with Harrison on my lap and Jamison beside us on our sofa…Jamison has 2 of his favorite books on his lap, and is reciting one. His baby brother’s eyes are locked on him, smilimg at him with a huge grin, babbling quietly every now and then, taking in every word. they don’t notice i’m witnessing this. harrison reaches out with his left arm. “you want this book?” jamison asks, and tries handing his brother a book. harrison doesn’t go for it. jamison holds up the book he was reading and offers it to him. harrison lets that drop from his hand, and reaches towards his brother again. “you want jamison’s hand?” jamison takes harrison’s hand. harrison giggles. jamison smiles at his brother…until he sees me looking at this little exchange. gives me a smirk, jumps off the sofa and starts playing with a truck. Moment’s over (boys, lol!! ), but I promise myself it’s one of many and I will remember it always. Thanks for sharing your stories and photos, I adore Noah because I also have my younger brother his name is Rulito. I adore him he is now 45 yrs old and we have adored him all the time. I am in NY now and Rulito is in Peru, adn we I saw this video I cried because I miss him so much. Thanks for posting such beautiful memories. 7 Fisher-Price Learning Toys To Help Your Baby Develop!